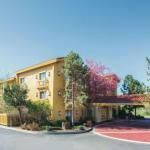 Free breakfast free Wi-Fi and budget-friendly rates come together at the pet-friendly La Quinta Inn Denver Westminster Mall which is near shopping and the freeway. This three-story hotel offers 130 rooms with flat-panel plug-and-play HDTVs free Wi-Fi coffeemakers and ironing facilities. Dig into fresh hot waffles for breakfast. Work on your tan line by the outdoor seasonal pool or ask about a pass to the nearby gym with an indoor pool and sauna. Laundry facilities are available. Pets are welcome and parking is free. The hotel is two blocks from Westminster Mall and U.S. 36. University of Colorado and Pepsi Center in downtown Denver are about 20 minutes away. Enjoy waterfront restaurants and shopping at the Westminster Promenade three miles north before heading to a concert at the Broomfield Events Center three miles west. Denver International Airport is 27 miles away. One large dog or 2 small to medium dogs are allowed. There are no additional pet fees. Dogs must be leashed.